Could your client’s 401(k) or 457 plan be missing the mark? Probably, because most of those plans do. Why? Most plan administrators do not allow 401(k) and 457 plan participants the option to purchase a fixed annuity to fund for future income guarantees. What can you do? Let’s look at some background information and then answer the question. Here are four common income options that 401(k) and 457 plan participants may select in order to generate retirement income. The fourth option combines the features of the first three options. This fourth option allows anyone from age 20 to age 60 and beyond to continuously accumulate a portion of their plan account or use a lump sum to guarantee many thousands of dollars in future income. This option also allows for ongoing guaranteed growth with principal protection, including access to principal at any time, even in retirement. Plus, participants can turn on their guaranteed lifetime income whenever they are ready to retire after the annuity contract has been in force for one year. An income start date of age 59½ or later is recommended to avoid the Internal Revenue Service’s 10 percent penalty for early withdrawals. Option 1: The client invests in mutual funds and, upon retirement, spends only the investment earnings, which typically consist of mutual fund interest and dividends. The client doesn’t touch the principal. Income will fluctuate and may not be sufficient. Principal is subject to investment risk. Option 2: The client invests in mutual funds and, upon retirement, draws down the principal cautiously using systematic withdrawals so they don’t outlive their assets. The client could run out of money if they live past their assumed age of death. Principal is subject to investment risk. Option 3: The client buys an immediate income annuity from an insurance company after retirement and lives off the monthly benefit the insurance company pays them. This option provides the client with steady income but no access to principal. The client’s account growth before retirement is uncertain because of mutual fund market fluctuation. If your client’s plan does not offer this guaranteed income option, they must ask their employer for it. Option 4: If your client wants guaranteed future lifetime income with access to principal with part of their plan participant account, there is a fourth option. 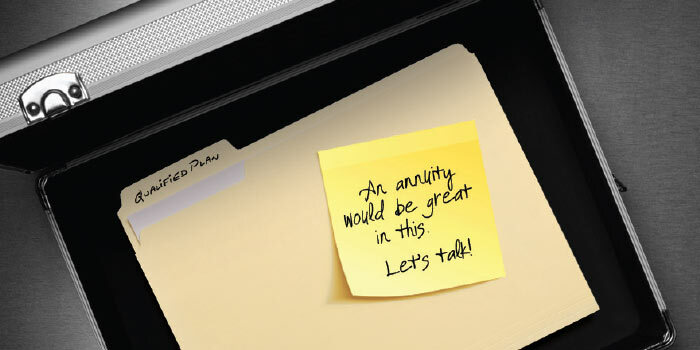 A fixed index annuity with a guaranteed lifetime income rider may be just what your client is looking for. Income payments can be guaranteed years in advance for deposits directed by the plan participant, whether they are in their 40s, 50s or 60s, or older. » The spouse may continue to receive the guaranteed withdrawal payments until the policy’s accumulation value is depleted. » The spouse or beneficiary may receive any remaining accumulation value in a lump sum or in a series of payments. On July 1, 2014, the Treasury Department added another income option to the mix described previously. It is the deferred income longevity annuity, which will reduce your client’s required minimum distribution requirements. With Option 4, as described previously, your client cannot outlive the payments. The Treasury deferred income longevity annuity will soon be available to your client, if their employer’s retirement plan adopts it. Sounds great, right? But wait: Option 4 and the Treasury deferred income longevity annuity will not be that easy for your client to obtain. A Hewitt Associates survey found only 16 percent of 401(k) plan participants have some form of future income option. However, many of the participants in those plans have to choose from the income riders of nonguaranteed variable annuities, and they elect not to do so. That leaves 84 percent of plan participants representing billions of dollars in plan assets with no kind of guaranteed future income funding option from which to choose. The problem arises because the guaranteed future income options mentioned in Option 4 and the Treasury deferred income longevity annuity, are funded by a fixed annuity, which is considered a guaranteed savings and income contract. This fixed annuity contract requires the plan administrator to manually report and keep records as required by the Employee Retirement Income Security Act (ERISA). Many 401(k) and 457 plan administrators refuse to approve the use of any savings products like the fixed annuity in Option 4 because they require manual record keeping and reporting. There are several reasons for the plan administrator’s refusal to administer these products; mainly they do not want to change their current method of electronic record keeping and reporting. For clarification, there are generally two reporting companies for 401(k) and 457 plans: the plan custodian and the plan administrator. These may be the same or different companies. The plan custodian holds the plan mutual funds and provides daily values for the plan participants. The plan administrator provides the plan record keeping and reporting for the IRS and the Department of Labor. What can you do to help your plan participant clients get this option added to their plan? If your clients want a guaranteed future income option added as one of their saving selections, even if they already have a variable annuity option in the plan, ask them to introduce you to their employer so you can explain what is needed to get the fixed annuity added as one of the plan savings options. It would be helpful to let the employer know their current administrator may not want to administer this new savings option because they may not want to do the manual record keeping and reporting, or if they do, they may want to charge a higher-than-normal cost for this manual service. These administrators may need to be replaced with a “fixed (guaranteed) annuity-friendly” administrator, who normally charges the same administrative cost as (or a lower cost than) your client’s plan is already paying. Finally, advise your clients that you are knowledgeable about which insurance companies to use for their plan and its participants and about how the fixed annuity product will work inside their plan, and, if necessary, help their employer select an annuity-friendly 401(k) or 457 plan administrator. To help you become more comfortable with the retirement plan language, there are continuing education courses available in your state for 401(k) and other defined contribution plans. Your goal is to become recognized as the agent that prospects, clients and employers look to for guidance in this relatively new area of guaranteed future lifetime income.